These circular concrete pedestal drinking fountains feature a stainless steel basin, push-button operated stainless steel valve, polished chrome-plated brass bubbler head, polished chrome-plated waste strainer, multiple concrete color and finish options with wire reinforcement, integral mounting feet, vandal-resistant stainless steel access plate, and 1-1/4" O.D. tailpiece. Heavy-Duty vibra-cast reinforced concrete construction with exposed aggregate finish provide a perfect addition to outside environments, along with a vandal-resistant access plate for added peace of mind. Stainless steel basin with a high-polished finish complements almost any setting, and it also resists stains and corrosion. 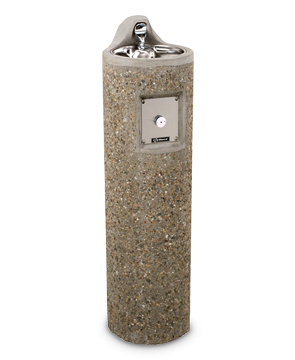 Vibra-Cast reinforced round concrete pedestal drinking fountain with exposed aggregate finish. Polished chrome-plated vandal-resistant waste strainer.